I concluded my unintentional Frederick Knott double-bill weekend with the fun and twisty murder mystery Dial M for Murder at Gremlin Theatre (see also Theatre in the Round's production of the English playwright's Wait Until Dark). It was fun to see the two plays back to back and notice the similarities: both take place entirely within an apartment with mention of a street door, both use phone calls to further the mystery, and both feature seemingly helpless maidens in distress who overcome their attacker and defend themselves, proving to their husbands that they are strong and capable and not so easily fooled. In Dial M for Murder, the husband plans the perfect murder, but if it were as easy as he thought to get away with murdering his wife, we wouldn't have a play. Gremlin's production is well cast and well designed, and tells an intriguing and engaging story. This play isn't a whodunit, as an early scene shows former tennis celebrity Tony Wendice blackmailing an old school chum to kill his wealthy wife Margot. Tony caught her cheating with American writer Max Halliday, who has recently returned to London. You can't really blame Margot, though, because Tony was a pretty jerky husband. Until he discovered the affair and started being nice, afraid she and her money would leave him. He also started plotting to kill her to eliminate that possibility. He lays out his seemingly foolproof plan (which, yes, involves a phone call), which of course hits a snag or two. He has to come up with Plan B on the fly, trying to explain the events of that evening to the detective in a way that doesn't arouse suspicion. Maybe it's not so easy to plan the perfect murder after all. Director Brian Columbus keeps the tension high and the mystery percolating until the very end. Everyone in the cast is very well suited to their roles. 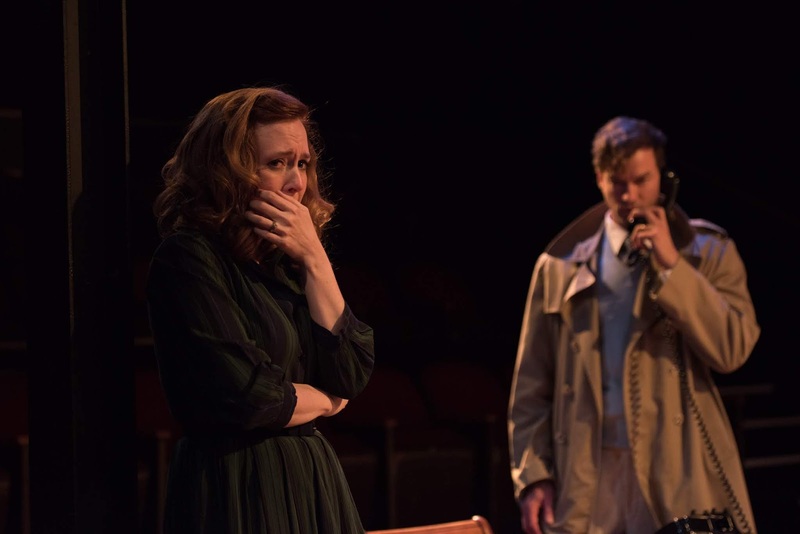 Emily Dussault is a strong and sympathetic as Margot; Dan Hopman is likeable as her American boyfriend; Peter Christian Hansen is both dastardly and charming as Tony; Grant Henderson displays the false confidence and the desperation of the man hired to do the deed; and Alan Sorenson has a Colombo-like quality as the not so easily fooled detective. And all (except American Max) speak with British accents that are fun to listen to. The design of the show on Gremlin's intimate stage helps to tell the story. The neat and proper English flat is arranged nicely on stage, including doors to the garden behind the desk, upon which sit some very important props. There are several phone calls, in which we hear the other voice muffled but clear. The sound of footsteps in the hall, and light shining from under specific doors, add to the suspense and mystery. I also enjoyed the attention to detail on the period costumes (set and lighting design by Carl Schoenborn, sound design by Inna Skogerboe, prop and costume design by Sarah Bauer). 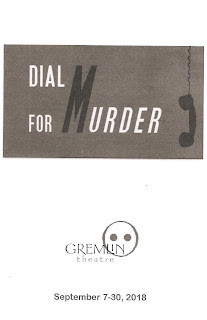 Dial M for Murder continues through September 30 at Gremlin Theatre in St. Paul, as does that other Frederick Knott classic Wait Until Dark at TRP in Minneapolis. See one or both to get your thriller chiller fix in an entertaining way.